We’d love your help. Let us know what’s wrong with this preview of Cardcaptor Sakura, Book 2 by CLAMP. 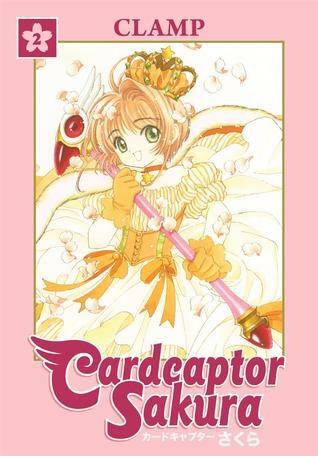 To ask other readers questions about Cardcaptor Sakura, Book 2, please sign up. This series is so pure it warms my heart. Sakura exudes warmths and it is impossible not to feel it seeping through the pages. While the plot on this one was a bit choppy, I really loved how character relationships are progressing and evolving. The art was very beautiful and moving, as usual. The Wood and Dark cards are drool worthy. "I don't want to be your master. I want to be your friend." Some parts were hilarious and literally had me laughing and other parts were so heartfelt and emotional that I could feel my heart breaking and tears close by. I still love these characters and the interactions and I love seeing more in depth stuff as this series continues. I grew to really like Kaho Mizuki. I'm not sure how I feel about (view spoiler)[Yue considering his connection to Yukito. I love Yukito and Yue seems a little hard "I don't want to be your master. I want to be your friend." Art is fantastic but it is indeed a but choppy. World: The art is beautiful and full of characters, classic Clamp. The world building is solid, it's not overly deep and complex and just shows enough for the story to take place. That being said it is still fun. Story: I watch the show first so ready this again also reminded me how it was a but choppy and rushed in story and character moments. Where the show was draggy and filled with filler this book does not stop. It's still very fun and beautif Art is fantastic but it is indeed a but choppy. Story: I watch the show first so ready this again also reminded me how it was a but choppy and rushed in story and character moments. Where the show was draggy and filled with filler this book does not stop. It's still very fun and beautiful but the quiet moments from the show are not as in depth here. It's a fast brisk read. Characters: Some big development for Sakura and how it has changed her status quo. Also wit Toyota, Yukito and new Mizuki all good little chunks of character development for the story. Would have liked a bit more depth but I'm not the target audience and age group. For what it is it's solid. A good second chapter that changes things which I like. Es la segunda parte de la captura de cartas y el juicio final. Todo es muy emocionante, se encuentran las partes más graciosas de todo el manga (mi capítulo preferido cuando captura las cartas de Luz y Oscuridad). Vemos como los personajes están mejor construidos y vemos diferentes facetas de ellos. Este tomo definitivamente es de Syaoran y Sakura. Después de que lo termines de leer, quieres comenzar el siguiente :). ¿Ya les mencioné las preciosas imágenes a color que vien ¡Este volumen me encantó! Just such a fun and addictive read. This ends the first arc, so roll on the third volume! I really liked this "volume" more than the first. Less hand-holdy (as in, not as much 'SIGN POINTING AT CHARACTER INDICATING THAT'S WHO WE'RE TALKING ABOUT'), more background on characters, less of the creepy student-teacher relationship business (or more like barely any mention of it), some good character development. I understand why this series has become such a beloved classic, apart from the weird stuff and the childishness. It's still a great series for practically any age. One huge plus for I really liked this "volume" more than the first. Less hand-holdy (as in, not as much 'SIGN POINTING AT CHARACTER INDICATING THAT'S WHO WE'RE TALKING ABOUT'), more background on characters, less of the creepy student-teacher relationship business (or more like barely any mention of it), some good character development. In love. It went really quick. There were some differences from the anime, but I still have more to read! Can't wait! Starting volume 3. Everything about Sakura is just lovely. It's getting pretty damn good! I'm excited to continue.. unfortunately it's (volume 3) already loaned out at the library so I'll have to wait until after my Japan trip to read on! So cute! I was in the mood for this. I just love the artwork and all the good feels! There are other interesting events in this book which I will leave to you fine readers to discover and enjoy for yourselves but one of the most important events of the series comes up before the end of original volume 6 when Sakura captures the last of the cards and has to face judgment from the Guardian Yue who appears and the truth is exposed before it sounds like Sakura must face new dangers in the second half of the series with her new magical key/staff. They are really doubling down on that inappropriate student/teacher relationship stuff. They're not at all necessary to move the plot forward either so it's definitely something they just wanted to include. This is more a book about relationships than magic. That's good and bad, the characters are all entertaining, but the agenda of the relationships could be off-putting. Are they really hoping to encourage 10 year olds to date their teachers though? I think they missed the chance to stretch thi They are really doubling down on that inappropriate student/teacher relationship stuff. They're not at all necessary to move the plot forward either so it's definitely something they just wanted to include. This is more a book about relationships than magic. That's good and bad, the characters are all entertaining, but the agenda of the relationships could be off-putting. Are they really hoping to encourage 10 year olds to date their teachers though? I think they missed the chance to stretch this story for years. How many cards did she even catch, 20? At least catch an entire tarot card deck worth since you can apparently use them for readings. Really they're just missing out on a lot of story potential! There are so many different types of cards they could've added, even just based on Chinese magic let alone English. These omnibus volumes are made up of three volumes each and the original volumes seem to not have a ton of issues in them so I'm guessing this is a monthly series rather than a weekly one so the crazy stretching of the story maybe isn't part of the usual game plan. An enjoyable continuation of the series, but again ruined by reference to a creepy and deeply troubling relationship between a 10 year old girl and her school teacher. I HATE that this is part of the story (even the very minor part that it is) because it really ruins something, that is otherwise a fun and happy manga. It's probably worse that it treats it like no big deal and makes one random reference to it across the whole 500 pages- WHY INCLUDE IT? IT'S SO UNNECESSARY!!! I also found the end p An enjoyable continuation of the series, but again ruined by reference to a creepy and deeply troubling relationship between a 10 year old girl and her school teacher. I HATE that this is part of the story (even the very minor part that it is) because it really ruins something, that is otherwise a fun and happy manga. It's probably worse that it treats it like no big deal and makes one random reference to it across the whole 500 pages- WHY INCLUDE IT? IT'S SO UNNECESSARY!!! I also found the end part of the manga (where Sakura gets the last 2 cards and is judged) moved quite quickly and Kaho Mizuki quite a pointless character (there simply as a diversion). A new teacher at Sakura's school is hiding magical powers from everyone but her, and soon reveals herself to be a shrine maiden - and if Sakura wants to continue gathering the Clow cards, she will have to figure out what she is willing to sacrifice for those she loves! CLAMP continues this classic series with more action, mystery and heart than ever before. What other secrets lay within the hunt for the escaped beasts? I'm really enjoying the series to the point that I actually started watching the anime despite school and everything. It is just so much, I personally really enjoy childish things like Sailor Moon and Fancy Lala it's just so pure to watch/read and this is just so colorful and vibrant and the characters become so much more interesting here. It is way too good for a childrens' story, I mean the amount of plot twists were so wow. One thing I was not expecting from the Cardcaptor Sakura manga was that it would be so different from the anime, especially because they are made by the same company. I still really enjoyed this volume. I love the message and the characters, the plot and the art. It’s just all so good and nostalgic. A great manga series! The continuation of Sakura’s adventures of collecting cards and daily life is thrilling and yet so very much heartwarming. I just love these characters! Definitely very excited to read book 3 and very curious what path CLAMP takes this story in. Also, as an elementary school teacher I love that this is a series I can share with my students. Great introduction to “magna”. Great art and cute character designs, as always from CLAMP! This collected volume wraps up the first series with the capture of the final card. But wait, there's more - a vision of Clow Reed himself promising trouble still to come? I LOVED this!!! The anime had to make up a lot of episodes that were never in the manga, though!